The Easter Bunny Has Come! 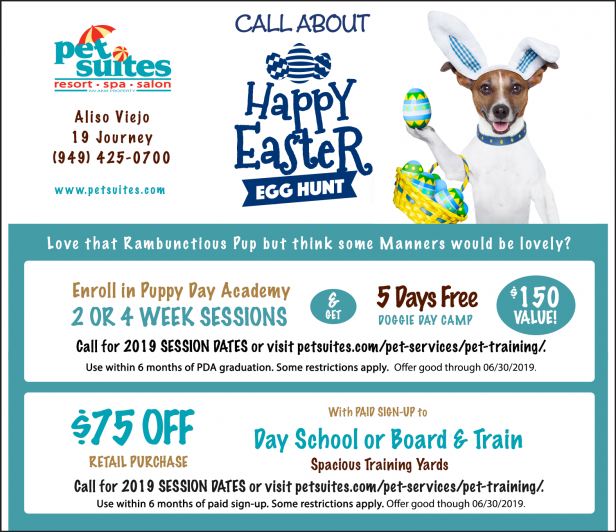 Get $75 off a retail purchase with PAID sign-up to Day School or Board & Train. 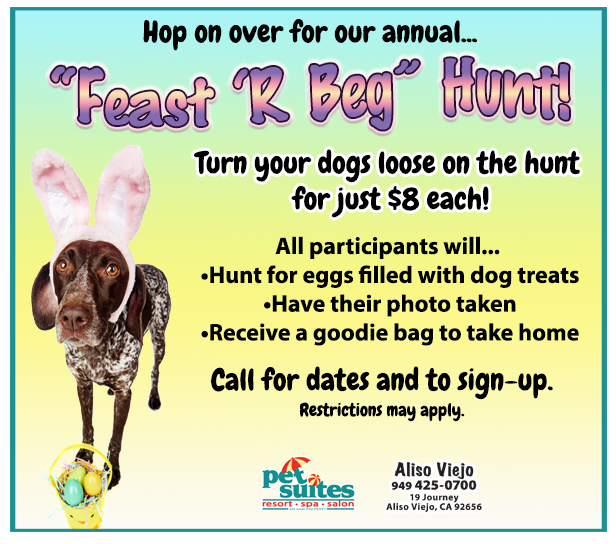 Also, don’t forget to call about our Happy Easter Egg Hunt – Feast ‘R Beg Hunt! Turn your dogs loose on the hunt for just $8 each! Call for dates and to sign-up! 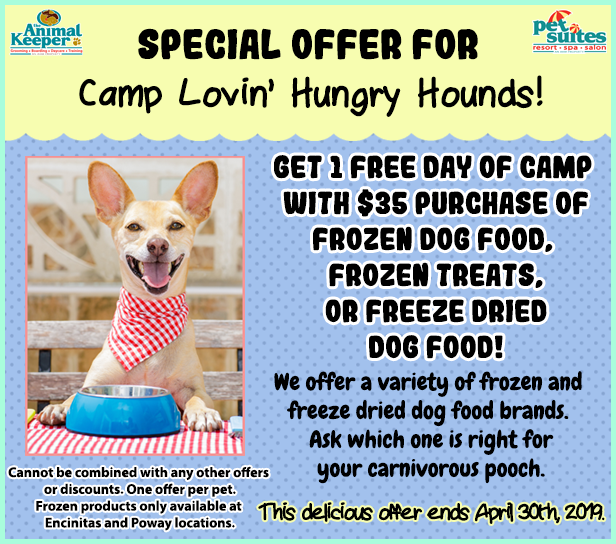 Get 1 Free Day Of Camp with $35 purchase of frozen dog food, frozen treats, or freeze-dried dog food! We offer a variety of frozen and freeze dried dog food brands. Ask which one is right for your carnivorous pooch. This delicious offer ends April 30th, 2019. 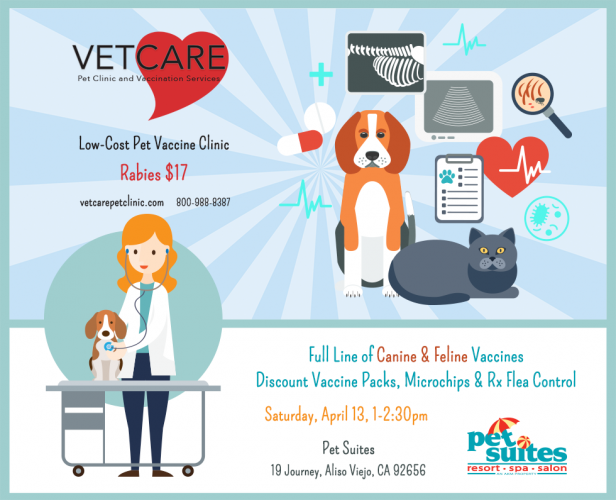 VetCare’s mobile van is coming to Pet Suites. Stop on by for low cost vaccines and other services. Walk-ins are welcome. Favorite Toy: Her favorite Frisbee. No others will do. 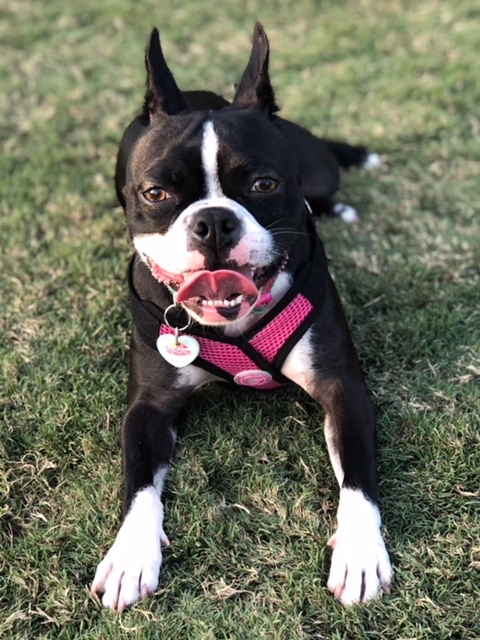 She won’t chase any others, just her favorite! Obsession: Her favorite human, Isaiah. She cannot get enough of him. 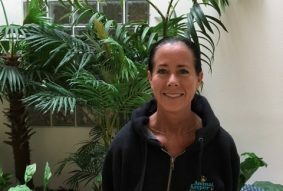 She’s also particularly fond of Brooke, an employee! Naughtiest Deed: Eating a winning lottery ticket! She’s lucky she’s cute. Pet Peeve: Last potty of the night. She gives her people the side eye when she sees them coming for her. A recent article at a mainstream pet health site discussed mistakes dog parents often make when feeding raw. 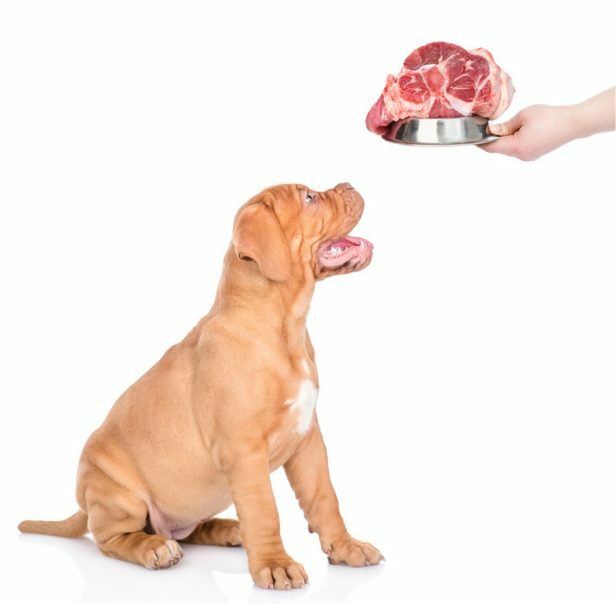 One mistake is not understanding your dog’s basic nutritional requirements, which includes assuming a raw diet for pets involves only meat, or meat, bones and organs. 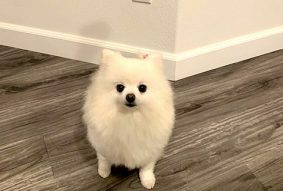 Other mistakes include overlooking the value of roughage, or low-glycemic produce in a fresh food diet, ignoring the need for appropriate dietary supplements, and being overly concerned with the safety of raw pet food. 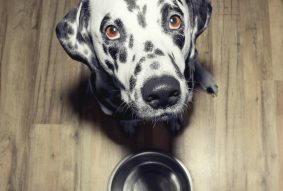 A growing body of research proves conclusively that raw and lightly cooked diets are easier for dogs to digest than extruded diets (kibble). 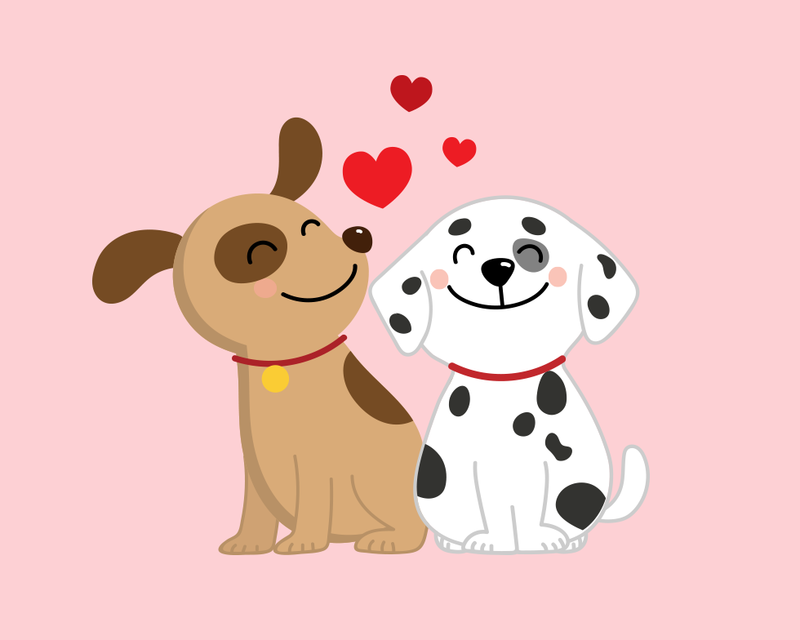 Dogs fed fresh food diets show positive microbiome changes and improved overall gut function. In addition, dogs eating lightly cooked and raw food had reduced blood triglyceride levels, even though those diets had a higher fat content than extruded dog food. A nutritionally balanced, biologically appropriate, fresh raw or gently cooked diet is always a better choice for pets than extruded diets. All of our locations will be closed to the public on Sunday, April 21, 2019 in observance of the Easter Sunday holiday. 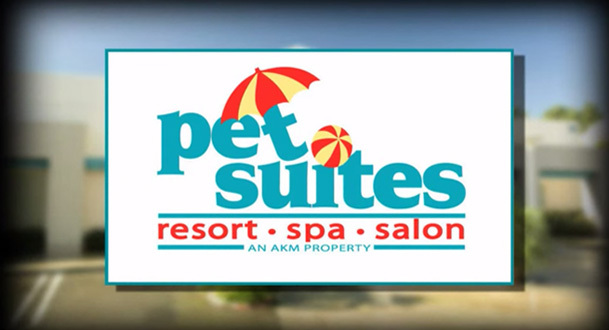 Staff will be on site regular hours to care for the boarding pets. Activities for boarding pets will not change. We resume regular hours the next day, April 22. We apologize for any inconvenience this may cause. We hope you all have a wonderful Easter holiday. 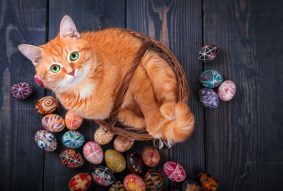 Click through to see Easter products from Charming Pet and Zippy Paws! We also have new products from Barkworthies, including Variety Packs by Dog Size and Superfood Rabbit Jerky.